Some of these features were previously hard to find on the eBay platform. For example, many sellers had no idea where their selling limits were hidden. Previously, selling limits were buried on the All Selling page at the very bottom, where many sellers never saw them. Also, many sellers weren't sure where to find Promotional Offers. They are now in a special section on the Seller Hub. It is easy to see at a glance where you stand on your orders. Many sellers check eBay first thing in the morning to review what orders need to be shipped, and any other actions need to be taken regarding orders. It is also helpful to see what items are still awaiting payment if invoices or reminders need to be sent. For unpaid items, it is best to use the Unpaid Item Assistant as it automates the whole non-payment issue. While keywords and finding paths are not provided, this information is useful over time to determine how traffic is trending. This report shows if traffic, click-throughs, and sales conversions are up or down compared to the previous 31 days. No more bookmarking these links on your computer. Simply navigate to Seller Hub and these links are all in one place. If you have not yet activated eBay Seller Hub, now is the time! Simply go to this page, click sign up now, and Seller Hub will open. eBay previously had a waiting list for Seller Hub as it was rolled out in waves. You may see an option to be added to a waitlist, but this option has expired and any seller can sign up now. 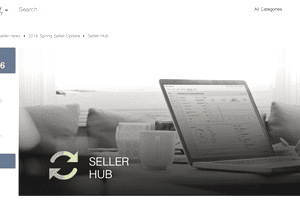 Seller Hub is free and has the same functionality as Selling Manager. By fall of 2016, all sellers will be transitioned to Seller Hub, so there is no reason not to start using it now. You will be glad you did!